The term bullbait means to find certain actions, words, phrases, mannerisms or subjects that cause a student doing the drill to become distracted by reacting to the coach. The word bullbait is derived from an English and Spanish sport of baiting which meant to set dogs upon a chained bull. It will be found that people have certain things that cause them to react in some way. In Scientology we call this a button: an item, word, phrase, subject or area that causes response or reaction in an individual. 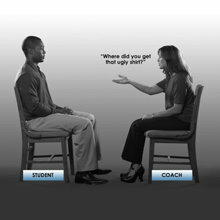 For example, the coach says something to the student like, “You have big ears.” The student reacts by laughing uncontrollably. The coach has thus found a button on that student. This is bullbaiting. 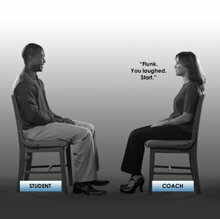 In the photographs above, the coach finds a button on the student (1) and flunks him for breaking his confront (2). 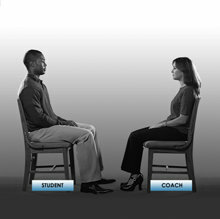 She resumes the drill and repeats the phrase which made him react (3), repeating it until the student can comfortably confront it,without reacting to it (4, 5, 6). She continues bullbaiting, trying to find another button. When she does so (7), she flunks the student with the reason why (8) and would now proceed to flatten the new button. Position: Student and coach sit facing each other a comfortable distance apart—about three feet. Purpose: To acquire the skill of being able to sit quietly and look at someone without strain and without being thrown off, distracted or made to react in any way to what the other person says or does. In the previous drill, a student learns how to confront with the coach just sitting silently. 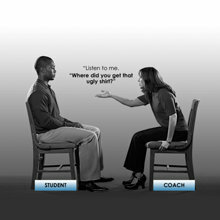 In TR 0 Bullbait the student’s ability to confront is increased further and he learns not to be thrown off by the actions of the coach. This enhances the ability to be there and deliver a communication to another, in any social or life situation, without being distracted by anything. For example, have you ever had the experience of talking to someone and becoming tongue-tied or flustered when the other person brought up some other subject? Have you ever reacted uncontrollably to something another said even though you didn’t want to? 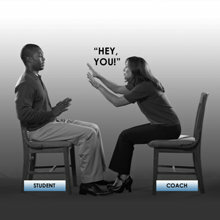 This drill can increase your ability to be more causative and in control, in all aspects of communication. 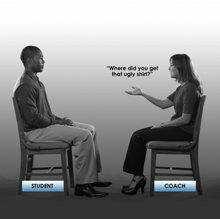 Training Stress: After the student has passed TR 0 Confronting and can just be there comfortably, “bullbaiting” can begin. Anything added to being there is sharply flunked by the coach. Twitches, blinks, sighs, fidgets, anything except just being there is promptly flunked, with the reason why.She continues bullbaiting, trying to find another button. When she does so (7), she flunks the student with the reason why (8) and would now proceed to flatten the new button. Patter as a Coach: Student coughs. Coach: “Flunk! You coughed. Start.” This is the whole of the coach’s patter as a coach. 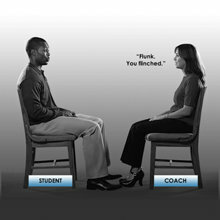 Patter as a Confronted Subject: The coach may say anything or do anything except leave the chair. However, the coach must be realistic in his coaching, giving real conditions and circumstances that could come up in everyday life. The coach may not touch the student. The student’s buttons can be found and tromped on hard until they no longer produce a reaction. Any words not coaching words may receive no response from the student. If student responds, the coach is instantly a coach (and follows the patter above). Student passes when he can be there comfortably without being thrown off or distracted or made to react in any way to anything the coach says or does and has reached a major stable win. an item, word, phrase, subject or area that causes response or reaction in an individual. walked on with heavy steps. Used figuratively.